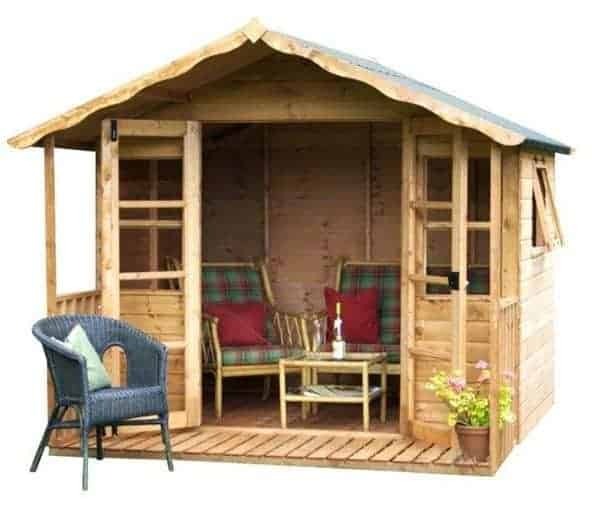 This 8” x 8” summerhouse is a fantastic place where you can spend countless hours relaxing inside and it also offers a wonderful veranda to help with all of your outdoor entertaining needs as well. The whole structure has a truly amazing look that is going to make your garden stand out from all the rest. There are a vast number of windows on the building that allow in plenty of light with one of them even being able to open so fresh air can get inside. 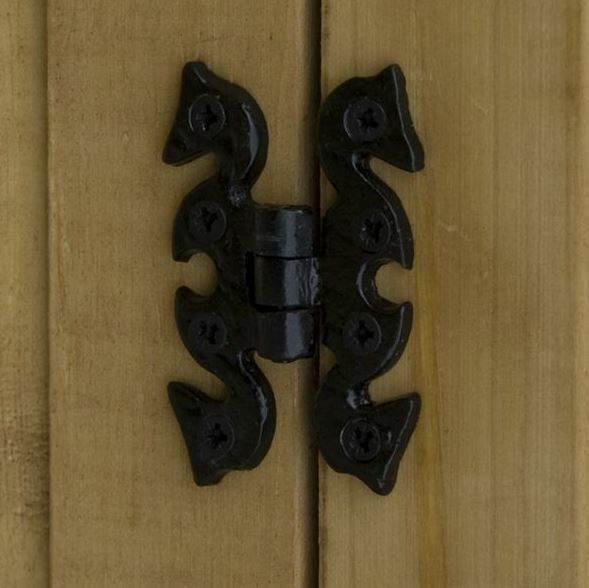 There is a very classic looking lock and hinge construct on the double doors. All in all, a very stylish and robust summerhouse. From the bottom to the very top this is a summerhouse that is high quality. The floor is very strong as it is made with tongue and groove boards and sits on a set of thick floor bearers. 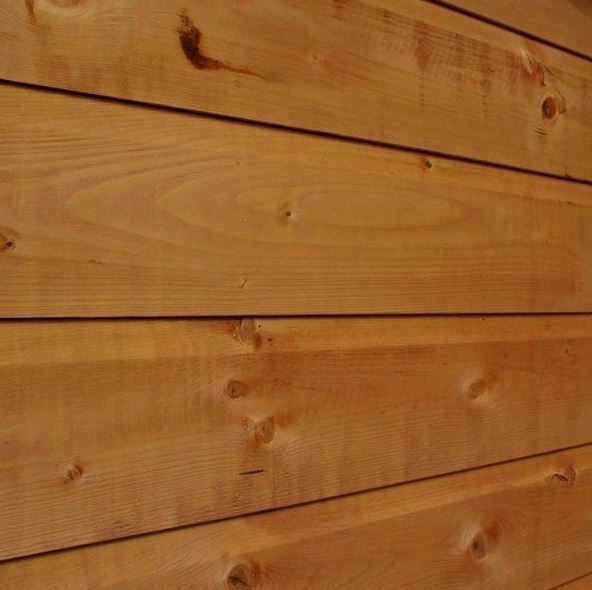 The cladding is 14 mm thick tongue and groove shiplap cladding which sits in front of a very robust frame. The roof is made with those same boards as the floor and as well as looking great they are also very strong. This is a summerhouse where they have worked hard to make it strong so that you are going to get many years out of it, but also they have ensured it has an impressive look to it as well. 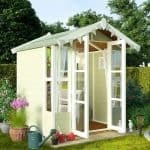 Today we are looking at a fantastic, more compact sized summerhouse that is going to be perfect for those of you with limited space or just those who do not want a summerhouse taking up the whole garden. The 8′ x 8′ Stratford Summer House With Veranda has a very attractive look to it. Before you even get into the summerhouse you have that awesome decking area complete with flooring and that lovely veranda, so if the weather is good then you could get the BBQ out, have a few drinks and sit out here. Inside the summerhouse the actual inner dimensions are not the largest we have seen, but as the actual structure is 8 x 8 that is really what we expected. Still there is enough room for a couple of chairs, table and a few other pieces of furniture as well. There is plenty of headroom inside here with the height along the ridge being 7 feet 8 inches. The eaves height is 5 feet 6 inches which to be honest with you is right around what we expected. The apex roof looks extra special thanks to that lovely veranda that sticks out. 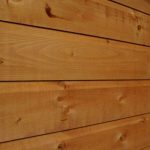 The roof on the inside of the summerhouse has a great look as they have used 12 mm thick tongue and groove boarding which is much nicer to look at than solid sheet boarding. On top of this on the outside is some heavy duty roofing felt which will protect those boards from the rain. 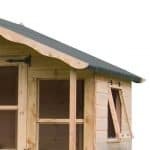 This Stratford line of summerhouses has a look that we really like and the way they achieve this almost log cabin type of look is with the gorgeous cladding. This is so smooth and well made that you cannot help but be impressed. This is not trying to get by on just its looks either as it is an impressive 14 mm thick so it is also incredibly strong. 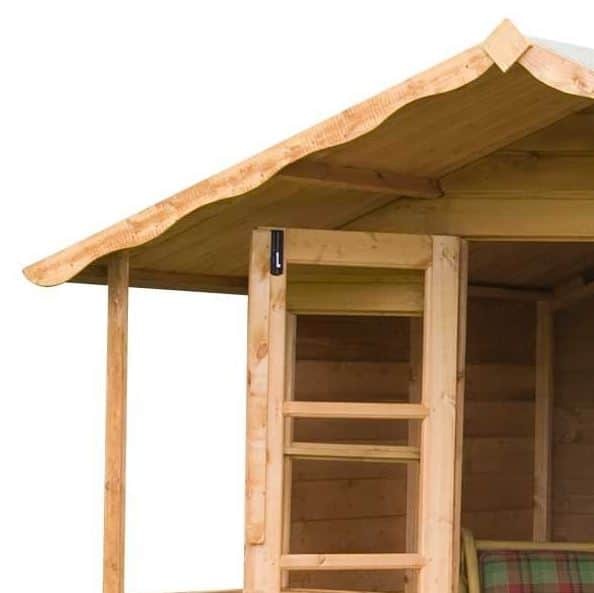 We are not saying that you will be hosting regular fight clubs or wild and crazy hootenanny’s inside of here, but this summerhouse would be able to take that kind of partying thanks to the thick and solid framing they have used. This frame is 45 mm x 27 mm and is a large part of what makes this such a long lasting structure. When you consider that this sits right behind that 14 mm thick cladding, you can easily see why this is such a strong and sturdy summerhouse. The flooring inside the summerhouse is made with those same 12 mm thick tongue and groove boards that the roof is. This is a great design choice as these boards look amazing and certainly go with the flow of the rest of the summerhouse, but they are also strong and able to take a lot of weight. 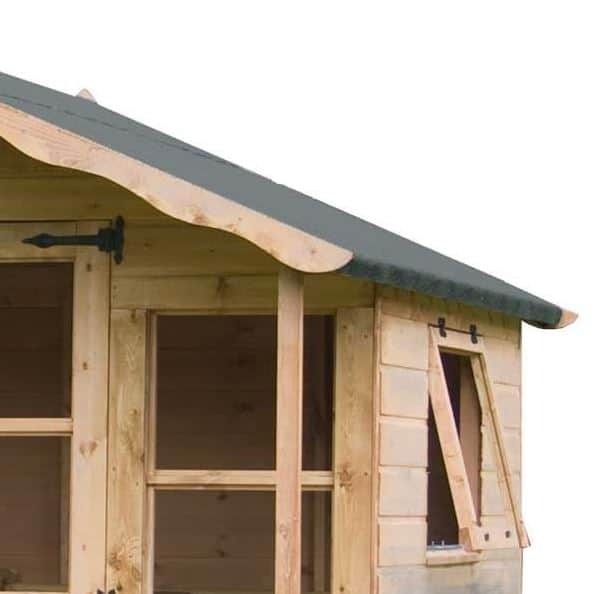 Under these boards we have a set of strong floor bearers which prevent the summerhouse from sitting directly on the ground which is ideal if you are going to be placing this on grass. That lovely wood we like has to be treated and done so shortly after construction. This should not take that long and it will not cost you a penny either. You actually get a free tub of treatment with this. You can choose from, Ivy Green, Golden Brown, Dark Brown and Cedar Red. 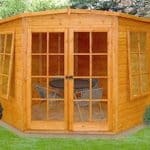 It is important to remember that annual treatment should be applied in order to give the summerhouse a rot free life. 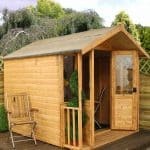 The 8′ x 8′ Stratford Summer House With Veranda comes with a ten year guarantee which is only valid as long as you treat the summerhouse, but as you are getting a free tub of treatment you really have no excuse not to. On the front of the summerhouse is a set of large double doors. These are mainly made up with 2.5 mm thick styrene and they really do look fantastic. They have used these antique style hinges which we just love and these will also stop the doors from sagging as the years go by. With the door being so large getting things like a table and a couple of chairs will be no problem at all. As well as the windows that are on the doors there is another two windows on the front of the summerhouse, one at each side of the door. These are fixed windows and are made with that same 2.5 mm thick styrene. On one side of the structure is a smaller window, but this one can actually be opened. Nothing spoils a summerhouse more than having to install a padlock and bolt, as this may be fine on a shed, but on a summerhouse it sticks out like a sore thumb. Thankfully the designers realised this and have actually included a very impressive lock on the doors so all of your items will be kept safely locked away when you are not using the summerhouse. This is not one of the more private summerhouses that we have seen. The vast amount of windows on the front make it very easy to look inside so you may want to consider adding some blinds or at the very least ensure you are wearing pants while you are inside here. It is actually very easy to customise this summerhouse as they are giving you a choice of four different colours of wood treatment. We are sure that at least one of these is going to be something that tickles your fancy and will fit in with what other things you have in your garden. You could also give the decking area a little bit of life with a chair or some kind of decoration. They are offering two extras with this summerhouse. The first one is an installation service which will save you the trouble and the broken thumbs that come with installing it yourself. While a great service, it is a little bit on the high priced side at £249.99. The other extra that they are offering is a plastic shed base that costs £161.99 and is something that is worth thinking about if you will be installing the summerhouse on grass. 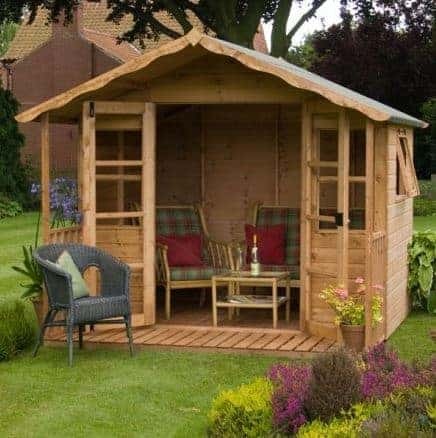 We really like this summerhouse and feel that the materials used are just incredible and as a result make this one very high quality summerhouse. This is certainly one of the smaller summerhouses we have seen so you will have to think long and hard about what you are going to put in here. However for those of you with a smaller garden. 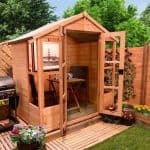 The fact this is of a smaller size, means that you will finally have found a summerhouse that your garden can handle. A good friend who does not mind getting bossed around, making the tea and has a tool box is something you will want to have. This is most certainly a two person job and will take you around 6-8 hours. This is a fantastic summerhouse which we really like for many reasons, but we do feel that it could be a little lower in price consider the size. Final Thoughts: From the first look the 8' x 8' Stratford Summer House With Veranda was a structure that impressed us a great deal. With its veranda and decking area it gives a very striking first impression. It is made with top of the line materials such as the tongue and groove boarding which is used throughout, which we must say are going to last for a very long time and the overall design is something we really like. 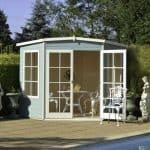 In all this is a great summerhouse and it is perfect for those of your with smaller gardens. 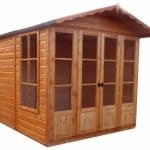 If you are looking for something that is of a very high quality and is going to give you a lifetime of use then this is the summerhouse for you.